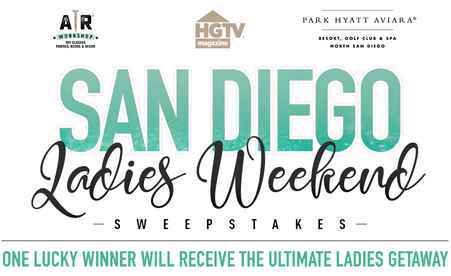 Hearst Communications brings you the HGTV AR Workshop San Diego Ladies Weekend Sweepstakes where they will be giving you the chance to win (2) night stay at Park Hyatt Aviara Resort for two people, Spa treatment, AR workshop class, $1,500 flight credit plus wine and free food during the visit. How To Enter: During the sweepstakes period go to this link: hgtv.com/sandiego and follow the online instructions to register by entering all information requested on the registration form and once you filled out the entry form now Click on the submit button to complete the registration form. Prizes: One (1) lucky person will receive two-night hotel accommodations for winner and guest at Park Hyatt Aviara(standard accommodations, single room, double occupancy)(ARV: $1,000);daily resort breakfast for two (2) (ARV: $165);one (1) AR Workshop class for two (2), two (2) San Diego Zoo passes(ARV: $110)spa treatment for two (2)(ARV: $430), plus food and wine during the visit (ARV:$250); $1,500 flight credit(ARV: $1,500);and a $225 meal gift card (ARV: $225);Total ARV of all prizes is:$3,680. Who’s Sponsor: The Sponsor of the Sweepstakes is Hearst Communications, Inc.and/or its joint venture partners,300 W. 57thStreet, New York, NY 10019.